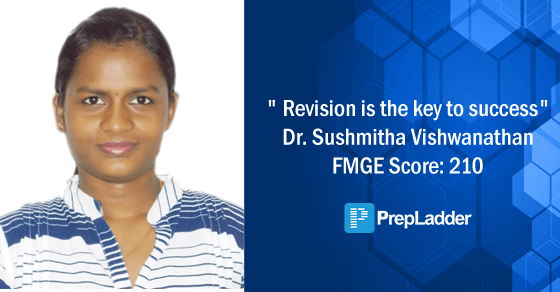 PrepLadder congratulates Dr. Sushmitha Viswanathan on clearing FMGE June 2018 exam. We wish her all the very best for her career and future ahead. In this exclusive interview with PrepLadder, she shares her experience and plan that worked best for her to help score well in FMGE. I am Dr. Sushmitha Viswanathan from Davao Medical School Foundation. I scored 210 marks on FMGE June 2018. Start reading the theory and simultaneously do the MCQ's of that topic. Yes, it is my first attempt. Read the topic thoroughly for the 1st time & then revision plays a big role. Devote at least 25 days for it. Yes, PrepLadder played the main role in practicing MCQ's. I also participated in FMGE Mock by Dr. Deepak Marwah conducted by PrepLadder and scored 165 marks. It was a very challenging exam. My score in mock motivated me to work more hard on revision. Read questions and options carefully. Revision is the key to success. Practicing more MCQs will help. We thank Dr. Sushmitha Viswanathan for sharing her success story.